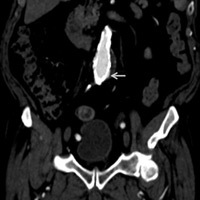 An 85-year-old man presents for surveillance CT angiography after endovascular repair of an infrarenal abdominal aortic aneurysm using an aortobiiliac Endologix endograft. 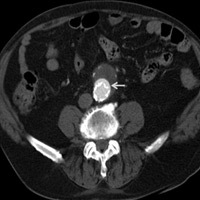 Axial (Figure A) delayed contrast-enhanced, coronal (Figure B), and sagittal (Figure C) maximal projection reformat CT images of the abdomen demonstrate a smooth, crescent-shaped collection of contrast medium (arrows) outside the metal struts at the midportion of the Endologix endograft. In patients who have undergone endovascular aneurysm repair, CT angiography is routinely used to monitor for complications such as graft infection, stent fracture, aneurysm rupture, thrombosis and, most commonly, endoleaks.1 It is important for radiologists to be familiar not only with the types of endoleaks but also the types of endografts utilized by the vascular surgeon. Type I: Inadequate or ineffective seal at the ends of the graft or attachment zones allows for the development of a perigraft channel with persistent blood flow outside the graft into the aneurysmal sac. Type II: Collaterals, such as from the inferior mesenteric and lumbar arteries, allow for retrograde flow into the aneurysmal sac outside the graft. Type III: Defect in the graft fabric or between the segments of a modular multisegment graft allows persistent leakage of blood into the aneurysmal sac. Type IV: Highly porous graft allows for minor blush of blood to diffuse across the pores. This may be an intentional design feature rather than a form of device failure. Type V: This involves continued expansion of aneurysmal sac without demonstrable leak on imaging. Surveillance CT angiography of patients who have received the Endologix endograft can demonstrate contrast medium outside the metal struts but contained by the fabric component. Although this phenomenon can be interpreted as type I or III endoleaks in the setting of other devices, the unique characteristics of the Endologix endograft makes this a normal finding, as illustrated by this case. Therefore, familiarity with this endograft type can help radiologists avoid misinterpreting a normal finding for an endoleak. — Charan Singh, MD, is the section head for interventional radiology and an assistant professor of radiology at the University of Connecticut Health Center. — Danilo Gomes, MD, is a radiology resident at the University of Connecticut Health Center. AorticAneurysmInterventionalPlanningAndFollowup.pdf. Last reviewed 2012. Accessed January 11, 2013. Hanley M, Steigner ML, Menard MT, Rybicki FJ. 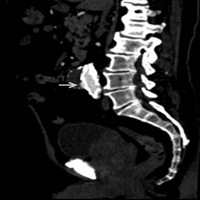 Endoleak mimic on CT angiography following endograft repair of abdominal aortic aneurysms with endologix stent-grafts. J Vasc Interv Radiol. 2012;23(11):1544-1546. Carpenter JP. Multicenter trial of the PowerLink bifurcated system for endovascular aortic aneurysm repair. J Vasc Surg. 2002;36(6):1129-1137.